Last week, two huge victories were achieved by individual action. One, of course, was the victory of Ted Cruz over David Dewhurst for US Senate. This win is being attributed to money from outside groups, to Dewhurst's negative campaigning, and to the delay in the primary schedule. While all of those certainly had an effect, Cruz won because individual voters took action by voting their values. Voters turned out in high numbers for Ted, doing their part to support a great candidate who had put together an excellent campaign despite being outspent significantly. He needed conservative grassroots support, and he got it. Throughout Montgomery County, Texas Patriots PAC volunteers worked in over 100 degree heat all day, handing out our voter guide to voters grateful for the work we had put into developing it. If you helped out, thank you! Once again, Cruz overwhelmingly carried Montgomery County, especially where we focused our presence. We aren't the protest vote anymore. When TPP has a candidate who supports our core values and who has a campaign with a path to victory, we will put the political muscle behind getting them elected. In Montgomery County, that means being at the polls at a minimum. The second glorious win last week was the effect of simply choosing to eat a chicken sandwich. 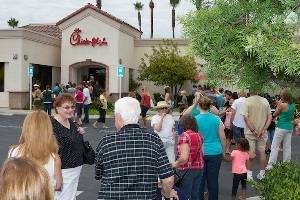 After leading politicians in three of America's largest cities threatened to block Chick-fil-A from operating because of the political and religious beliefs of its ownership, customers flooded into Chick-fil-A locations across the country - not to overtly protest, but to show support for the fast-food chain in the face of, well, intolerance. In crowded restaurants, senior citizens, moms with kids in tow, teenagers, and blue and white collar workers waited patiently to park, then to order, then to receive their food. This was a happy, peaceful, mainstream crowd. What does that say about the opposition? Remember these victories in the days ahead. We have found our voice. We are strong and cannot be defeated when we are clear about our conservative values and take simple actions based on them. Conservative principles are universal and apply to the ways we live, no matter our color or economic status. We did built that, and we are proud of it. President Obama, read the TEA leaves. You will lose big in November.